When I was in sixth grade I got my first bird, a turquoise budgie hen I named Moonbeam. This one pet plunged me head first into the world of birds. You know how it starts- first one bird, then another to keep that one company, then a few more, then pretty soon all those birds decide to multiply themselves... I actually have my mother to thank for getting me into breeding. She's the one who first bought a nestbox. She wanted the birds to have a nice place to sleep at night. 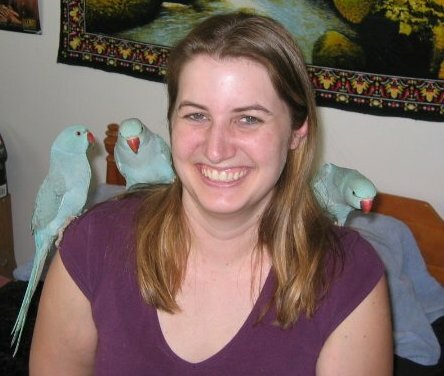 Pretty soon I had budgies everywhere. After that I got into cockatiels, first as pets, then as breeders. I regret not learning/being willing to handfeed until my junior year of high school. Bird Talk generated my interest in other species but I usually just thought "one day I want to get some of those." After saving up money I was able to start purchasing some more expensive species. My first "big" pair were white-winged parakeets (Brotogeris versicolorus versicolorus). Unfortunately they never bred, just yelled. 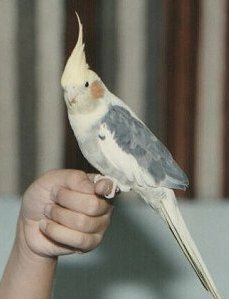 After that my grandpa hooked me up with Jaynee Salan (somewhere along the line I got my grandpa into birds too via buying my grandma a sweet little cockatiel named Alex, which she promptly gave back). Jaynee located a nice pair of kakarikis for me. They quickly became my favorite species. After my disappointment with Brotogeris I decided to stick to breeding Australian/New Zealand parakeets. The summer of my senior year of high school I did volunteer work for Jaynee. I learned a lot about ringnecks and birds in general. I even bought a lutino ringneck that I was handfeeding for her. 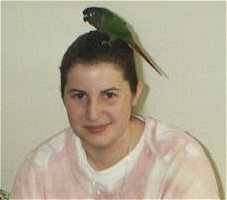 In 1997 I graduated high school and began attending UC Davis as an Avian Science major. My second year I became the co-president of the Avian Science Club and did some intern work with the university's flock of orange-winged amazons. Sadly, I became disillusioned with my dream of going to vet school while attending. It can take over five years of applying just to get in. I watched some of my fellow AVS majors apply two years in a row and not get in, even with a 4.0 GPA and work experience in the field. This and several other factors convinced me to leave Davis (1999). I worked for a year before returning to school in Southern California. My new goal is to get into avian research, but that is still several years away.